For larger accounts with multiple locations, the challenges of purchasing and distributing uniform products to your employees can prove time consuming and costly. The UniformMarket Store System takes the hassle out of administering your program by developing a custom store online to purchase your uniforms. All services you need to distribute your custom uniform program to the field can be managed from a single Web store. 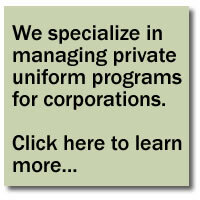 Regardless of your needs, we will design a program that makes sense for your organization. Call 248-477-4434 to get your program started today! Fill out our Contact Form - Our sales force will contact you to get you started. What is a private store? It is an online uniform store set up specifically for a particular group. Employees can access a private store and view the exact uniform they need. Private stores eliminate confusion and misunderstandings and ensure that employees get the correct uniform apparel, footwear and accessories every time. How do your customer's employees pay for their uniforms? How private do you need the store to be? Low Level Security - a publicly visible store, good for customer stores who offer goods to both the general public and their employees or locations. Good for promotional product/apparel programs. Medium Level Security - general password used that any employee or locations can use to access store. Once in the store, employee sets up their own account with their individual login/password. Good for hospitality and health care programs. High Level Security - unique user names and passwords required for every shopper before they can enter store.